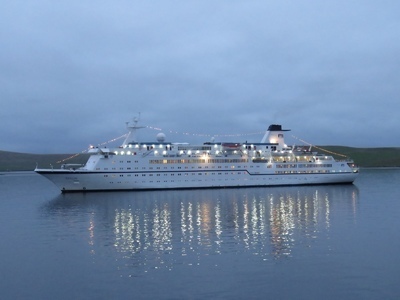 Zoom imageMV Berlin at anchor of Hamars Ness getting ready to land passengers The cruise ship MV Berlin paid a visit to Fetlar on Thursday 8th June as part of the "Northern Delights" cruise organised by the National Trust for Scotland. The passengers who were landed by launch, were the first cruise ship passengers to land at the new pier facility at Hamars Ness. 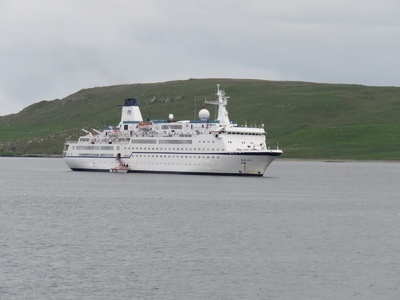 The ship arrived at anchor of Fetlar around 4pm, 2 hours behind schedule. Well over 200 passengers came ashore, while most undertook the planned tours a few took the opportunity to just take a pleasant stroll "along da banks". The late arrival did pose some challenges but with the support of a great many people the planned tours all went ahead with only the odd minor change. 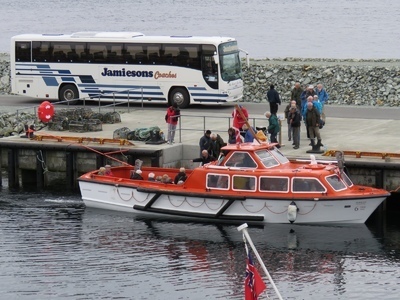 Passengers booked on a selection of tour options, with the tours featuring a range of guided walks led by RSPB and Shetland Nature proving particularly popular. A less strenuous taste of a Fetlar experience attracted many and included a short guided bus tour, entrance to the Fetlar Interpretive Centre along with afternoon tea, various craft demonstrations and stalls from makers all across the North Isles. This was topped off by live music from some of Shetlands top musicians including; Brian Nicolson, Michael Phillips, Kirsten and Derek Hendry. They were joined by Brian Gear and Leonard Brown, resident musicians on the ship, for some fine tunes during the afternoon. 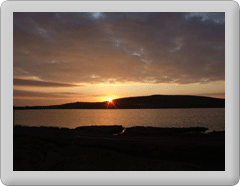 Robert Thomson from Fetlar Developments commented " Our aim was to put together the best quality experience we could. Showing off Fetlar and its fantastic wildlife to our visitors. Feedback has been very positive and I hope this positive experience may lead to future visits." All pictures are courtesy of Keith Nisbet. The Fetlar Interpretive Centre is a small, dynamic, community-run museum giving you the chance to walk through exhibitions on history, archaeology, folklore and wildlife.